Any sports car enthusiast will appreciate the power and grace of this cross-hatch treatment applied to this race-winning beast with it’s pleasant hues of blue greens against a complex pattern of fibonacci spirals and wavy surface lines. 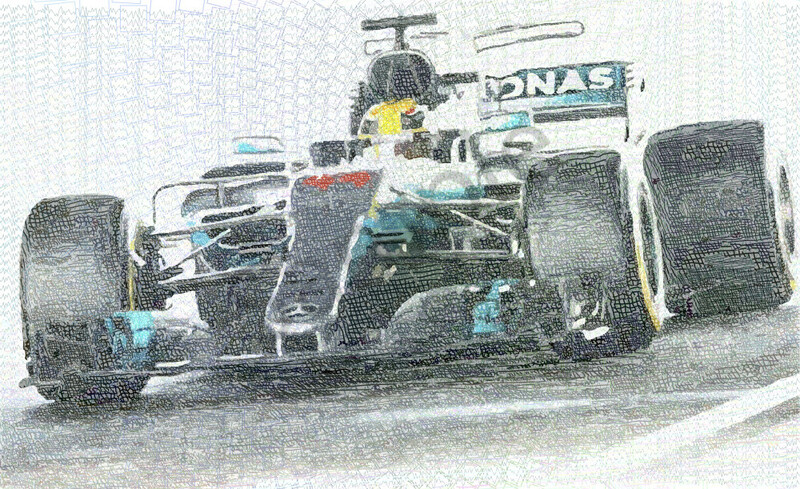 A tribute to Lewis Hamilton and the Mercedes AMG Petronas team 2017 F1 Champions! Lewis Carl Davidson Hamilton MBE (born 7 January 1985) is a British racing driver who races in Formula One for the Mercedes AMG Petronas team. A four-time Formula One World Champion, he is often considered the best driver of his generation and widely regarded as one of the greatest Formula One drivers in the history of the sport. He won his first World Championship title with McLaren in 2008, then moved to Mercedes where he won back-to-back titles in 2014 and 2015 before winning his fourth title in 2017, making him one of the most successful Formula One drivers of all time. Statistically the most successful British driver in the history of the sport, Hamilton has more race victories than any other British driver in Formula One. (62), and holds records for the all-time most career points (2,580), the most wins at different circuits (24), the all-time pole postions (72) and the most grand slams in a season (3).